I love green tea. I also happen to love coffee. Since I’ve been making so many fruit-based desserts lately, I wanted to switch things up a bit and make something that has a bit of bitterness to it rather than something tart, but I was torn on which to pick; green tea or coffee? Why not both? 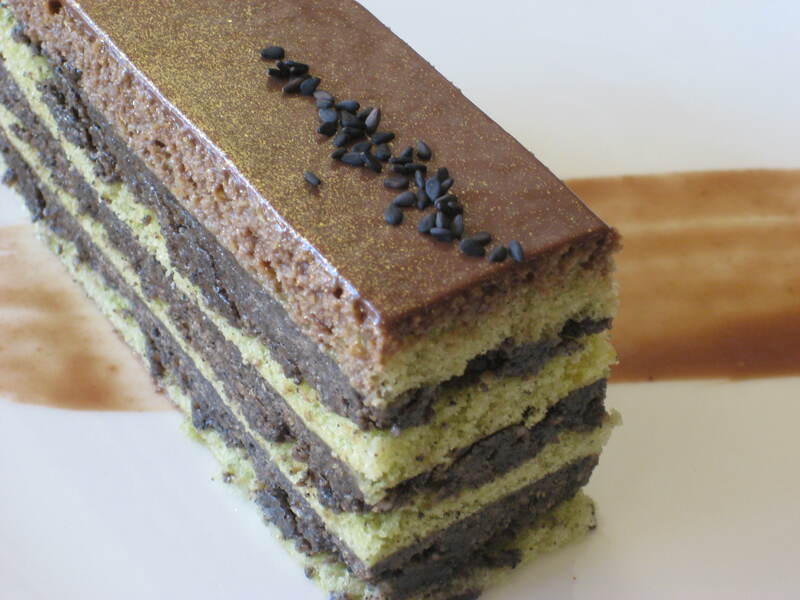 This cake has layers of green tea sponge cake and black sesame halva filling, and is topped with a creamy mocha glaze. I have to say, the flavor combination couldn’t be more perfect. The black sesame filling before adding your chocolate. Halva is a sweet sesame paste, similar in texture to tahini but much, much sweeter. It provides an intensely nutty flavor to the cake, and the addition of toasted black sesame gives a slight crunch to the filling. Overall, I’m very satisfied with how this cake came out. I’ll admit that I was a little hesitant about the outcome as I was making it since I was just experimenting with these flavors, but it turned out to be one of the best tasting cakes I’ve made yet, so I’m very proud of it! 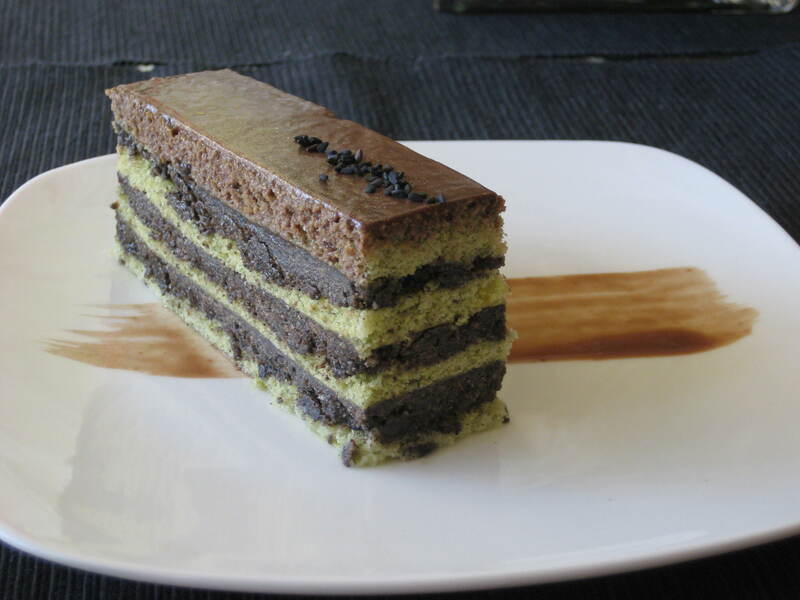 For green tea sponge: Preheat your oven to 350F, and grease a 13×17″ jelly roll pan, and line it with parchment paper. In the bowl of a stand mixer, whisk together egg yolks and whole eggs with sugar on high until eggs are pale and very thick. In another bowl, sift together your cake flour, baking powder, matcha, and salt. Fold your dry ingredients into your eggs, and spread batter over your sheet pan using an offset spatula. It should be a very thin layer. Bake for 12-15 minutes, or until the top of the cake just barely gets a little color. Cool completely, then refrigerate. 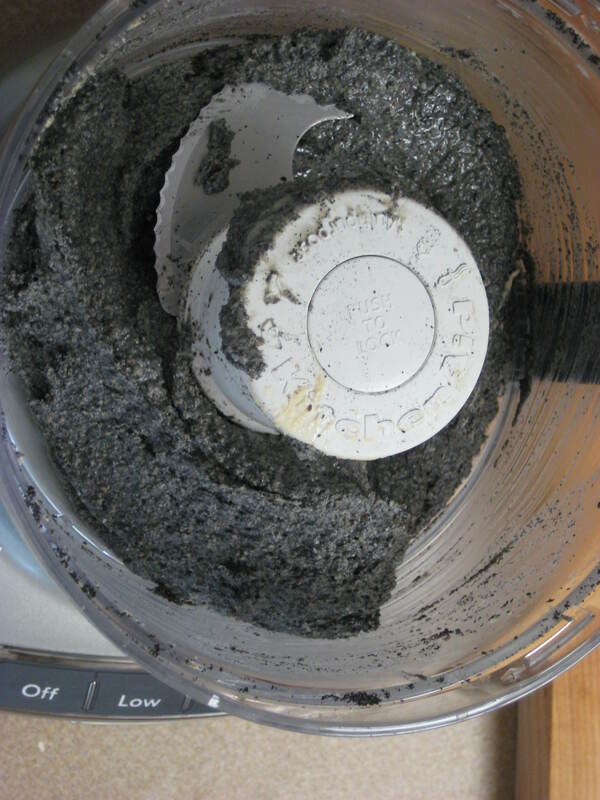 For black sesame filling: Toast your black sesame seeds in a pan over medium high heat until the seeds become slightly aromatic, then while seeds are still hot, pulse in a food processor for about 1 minute, just to break up the seeds. Add your soft halva to the seeds and blend another minute until mixture is slightly smooth. You don’t want to blend it too much because you want it to still be slightly crunchy. Add your melted chocolate and blend just until combined. Mixture will be really thick. Store at room temperature. For mocha glaze: Bloom your gelatin in your water. In another bowl, whisk together sugar, cocoa powder, and salt until there are no lumps. Set aside. In a small saucepot, combine your coffee and cream and heat over medium heat until steaming. Whisk in your sugar/cocoa mixture, then whisk in your gelatin mixture, and just heat until the gelatin is melted and the sugar is dissolved. Glaze will be really thin. Chill until glaze thickens slightly (this could take a couple hours depending on how hot you got your coffee/cream). For assembly: Cut your cooled sponge cake into quarters, then spread a layer of your halva filling on top of one of the cake quarters, and layer on the next cake, and repeat, finishing with sponge cake on top and pressing down to make sure the surface is flat. Chill until filling is firm. When glaze has cooled, cover the cake using about half of your glaze (the top layer of sponge will absorb this glaze because the glaze is thin) and refrigerate until set. Pour the rest of your glaze on top, then spread into an even layer over the cake. Glaze should look glossy. Refrigerate until glaze is set, then using a very hot, clean knife, trim off edges of cake and cut into bars (you should get 6 (1×4″) bars). 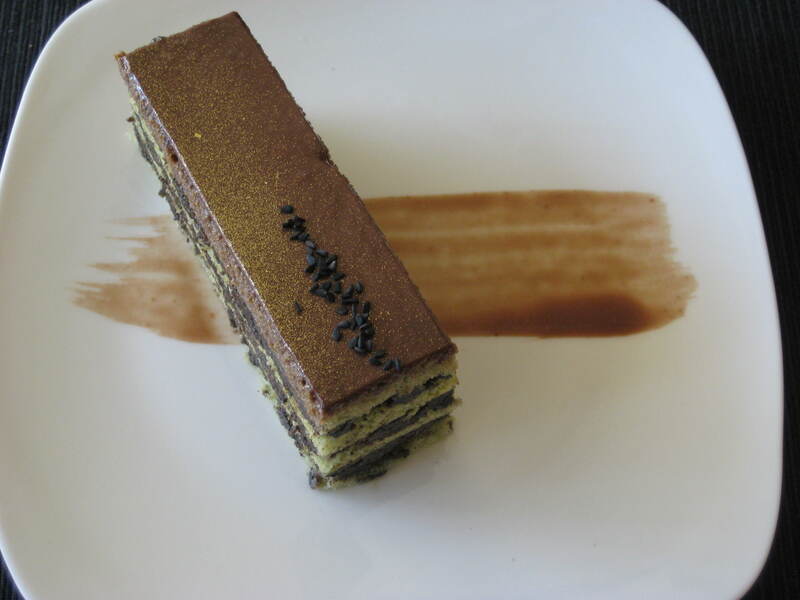 I dusted the top of mine with a bit of gold dust and then sprinkled some more black sesame seeds on top for garnish. Enjoy!